The UltraCane is an electronic mobility aid for use by visually impaired people that delivers a "step forward" in assistive technology. The UltraCane gives mobility assistance to blind and partially-sighted people by emitting ultrasonic waves, just like the echolocation system used by bats and dolphins. In fact, it was from the knowledge and understanding of bats that the UltraCane was first developed. The bat emits an ultrasonic pulse and times how long it takes for the echo to return. By its implicit knowlege of the velocity of sound in air, the bat is able to calculate the distance to the object. This knowledge has been transferred to the UltraCane, which works in a similar way. 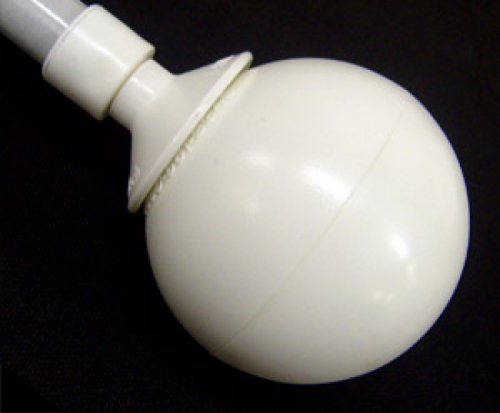 Ultrasonic waves are emitted through two transducers on the handle of the UltraCane and bounce off objects and obstructions in the path of the user. The UltraCane has two ranges to choose from: a short range mode, which detects obstacles within approximately 2 metres of the handle, and a long range mode, which detects obstacles within 4 metres of the handle. 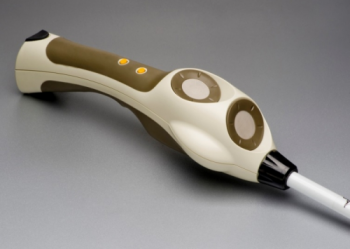 The upper transducer can locate objects approximately 1.6 metres from the handle. Feedback on obstacles is provided through two vibrating buttons located on the handle. These indicate the proximity of the object, and whether it is low down and in front of the user, or whether it is at or above head height. 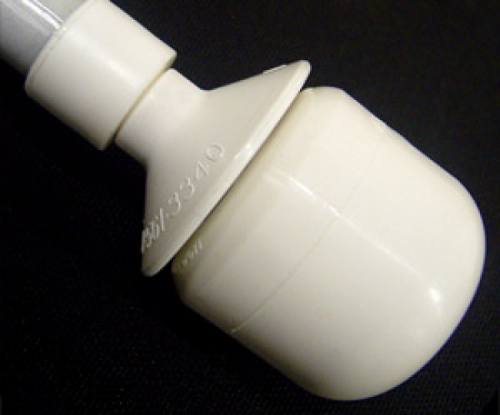 This tactile feedback provides the user with much more detailed information about potential dangers ahead than is possible with a traditional white cane. It is particularly useful for warning of hazards at head height. The UltraCane gives the user more knowledge about their environment and enables them to make decisions much more quickly, thus allowing them to move around more safely, confidently and effectively. 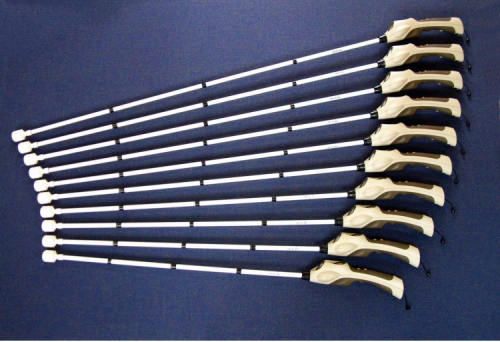 UltraCane comes in a selection of lengthsIf you are a standard white cane user, then please use the current length of your cane and order the same size UltraCane. Sizes available range from 110cm to 150cm in 5cm increments. If your existing cane size falls between the UltraCane sizes, for instance if your cane is 122cm, then please order a 125cm UltraCane. We recommend that you order a cane at the next longer size rather than ordering a cane that is too short. If you do not have a standard white cane, it is important to ensure that you order the correct Ultracane length to suit your height. If the UltraCane is too short, the user will hold it at too steep an angle, and the sensors will point downwards towards the floor, How to size your UltraCanewhich will give constant obstacle detection vibrations from the ground. 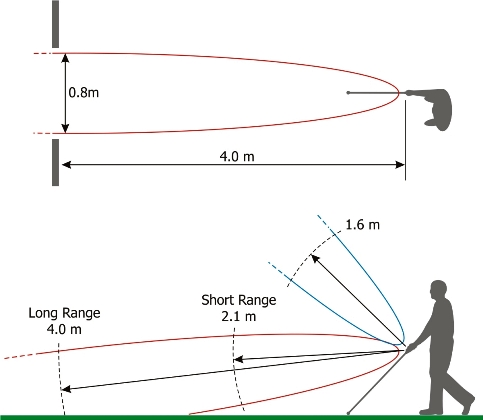 If the cane is too long it will be held at too shallow an angle and it may not detect objects on the ground forward of the user. 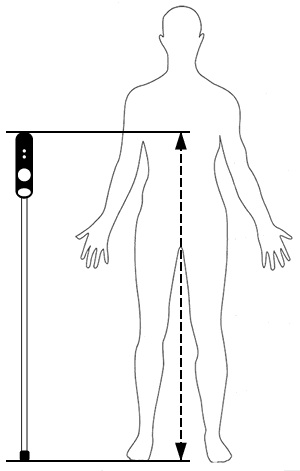 As a guide only, to obtain the correct measurement for an UltraCane you will need to measure from the centre of your breastbone down to the ground. If you are unsure then please ask someone to help you. Alternatively, please contact us for further assistance. Please contact us if you require an UltraCane length that is not advertised, as we may be able to supply UltraCane’s shorter than 110cm or longer than 150cm. Note: We will contact you for your choice of 1) UltraCane length and 2) tip.